This was my first year of riding a drop handled bike since I was a kid, and I’ve got to say I was really enjoying it. I’d been riding mountain bikes for years and I was finding that the riding was getting more and more extreme. Although I enjoy the exhilaration of flying flat out down the side of a mountain I was missing the big-day-out countryside adventure, and I’d had a couple of near misses where the outcome could have been so different. I couldn’t see myself as a flat-out roadie, so after a couple of chats with Jim at Independent Bike Works I purchased the Lapierre Cross Hill 500 Gravel Bike – the perfect compromise. One of the reasons for getting this bike was having the ability to ride from my front door. 90% of the time I was having to put my mountain bike in my van, drive somewhere, get covered in you-know-what, come back home and spend an age cleaning the bike… only to repeat it all a few days later. It was wearing thin. 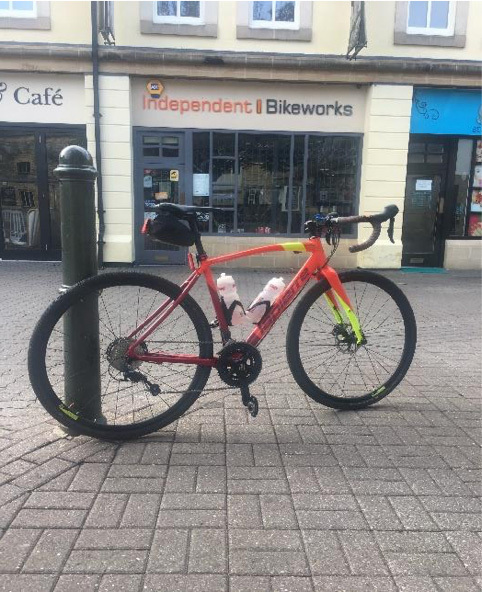 For me, the best reason for using a local bike shop is that you get immersed in a community of likeminded people; Wiggle hasn’t called me on a Monday and asked me if I fancied a ride at the weekend! Soon I got into riding regularly on a Thursday night with a few mates. Apart from the cold winter weather, I was thoroughly enjoying it. The mileage and the speed started to creep up, and I did my first hundred miler in April – I came close to having a snooze while riding on the closing stages of that one! I signed on to my first road sportive in May – Cogfest, a great friendly event starting in Minchinhampton. The next big event was the Chavenage Sportive. I had the great idea of riding to this event and riding back when it was all done – after all the event was only 80 miles! There were some big ol’ hills early on in this ride, which finished my legs off (that’s my excuse anyway) and even a well-filled ciabatta couldn’t bring my energy levels back. More training was needed. A few guys I know from mountain biking also ride road bikes with the Tetbury Velos, so I asked to join them. 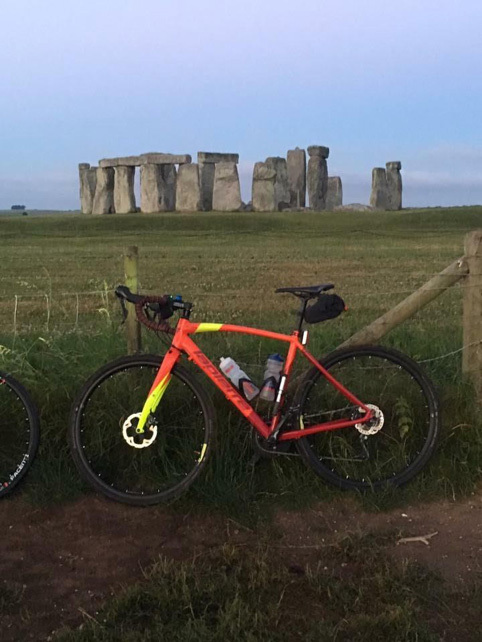 A bit daunting this, as they are some strong riders, but there was no need to worry – they’re a friendly bunch who ride some great routes through the Cotswolds… and they stop for cake! What’s not to like. I did another 100+ ride with Jim into Oxfordshire and back. 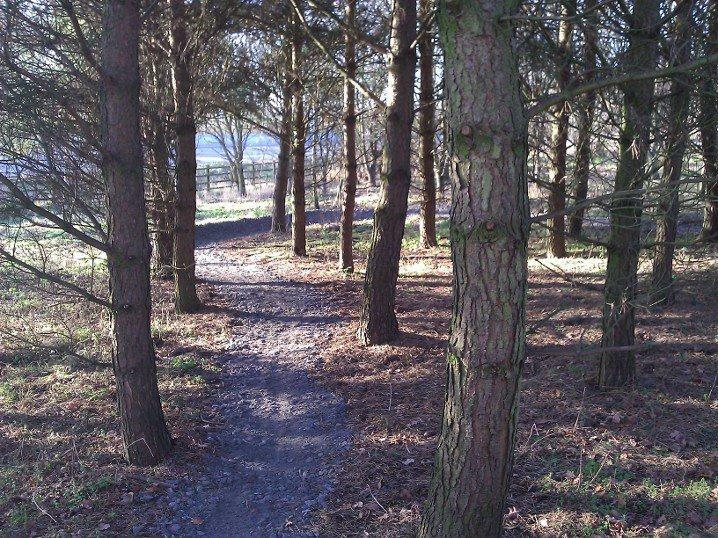 These 100 mile rides are great, a good day out, seeing some great countryside which takes your mind off the fact that you are getting some great exercise. On our Thursday night rides we did take on a couple of the gravel tracks around the lakes at South Cerney, which was great fun and got us thinking ‘Let’s ride more gravel,’ so an event called the Gold Rush was entered, part road and part gravel tracks, starting from Salisbury racecourse and heading over to Shaftsbury, which has a delightful and famous hill called Gold Hill, that got me walking that one and then headed back towards Salisbury on a brilliant fast gravel road, the bug was caught. What could be the next challenge? 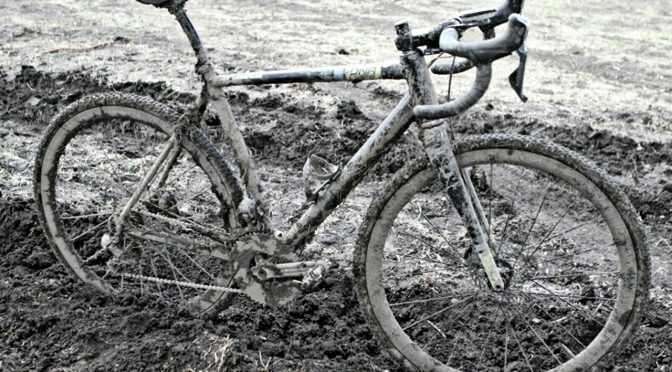 A quick look on the internet and there it was – The Dirty Reiver, a 200km gravel ride in the Northumberland country side, breaking into Scotland and back. I had at least 6 months to train for it, plenty of time! Anyway, winter came and the terrible weather – and a hundred other excuses – meant that I wasn’t getting out on the bike to train for this event. April the 21st was getting closer and closer but – no worries – I’d ridden over 100 miles before, it would be fine! The weekend of the Dirty Reiver was with us. Jim, Dave and I headed up North, checked into the B&B then went down to the pub to do some carb loading. We woke up the next morning at stupid o’clock so that we could get to the start line for 7.00am. 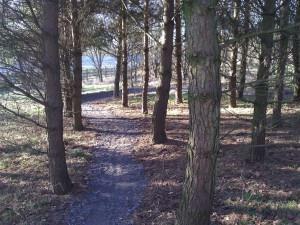 The weather was great, a little cold but it was dry – perfect riding conditions. Off we went with 800+ riders. This event was on some of the best gravel tracks I’ve ever been on. The scenery was stunning, the hills went on for what seemed like for ever, decents were fast, riders were friendly… just brilliant! One thing I underestimated was nutrition. 89 miles in, I just ran out of energy. I talked nicely to the guys at the feed station and got a lift back – perfect! I will be back to this event to deal with some unfinished business. It’s been a great year.The Crosshill 500 has been an amazing bike, it’s taken everything I’ve chucked at it (which is a lot!) 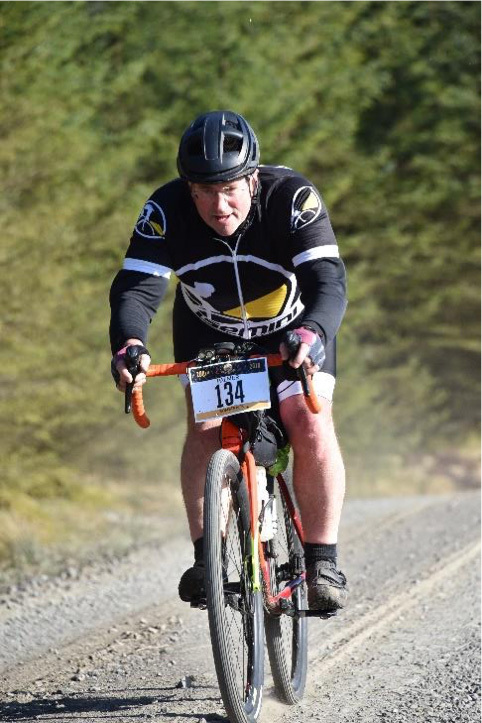 I’ve thoroughly enjoyed the riding, and getting fitter has improved my enjoyment on the mountain bike too. Sunday turned into a really warm November day. We had several tasks planned. We had some new sign posts to install on crossing points. On the front these warn riders to slow down for path crossings. On the back there are no entry signs for bikes and pedestrians. The signs have a plywood core with self adhesive laser printer film on both sides and outer layers of perspex. The wooden parts have been built by our resident joiner, Jez. 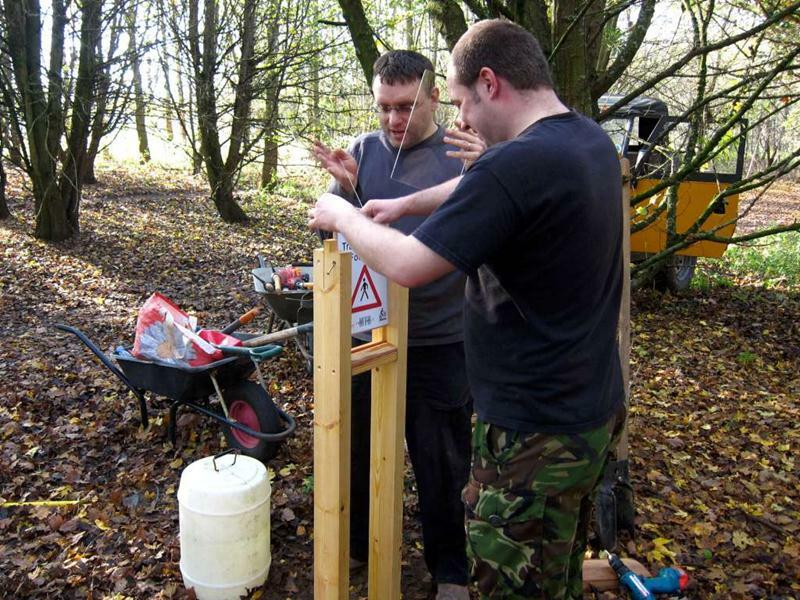 Rafe, Phil, Jerome and Tom worked on installing sign posts. Mark arrived to help a little later. 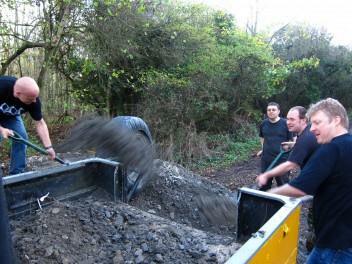 Meanwhile a working party of Phil (not Mayger), Nigel and Matthew Kerry raked leaves off the trail. 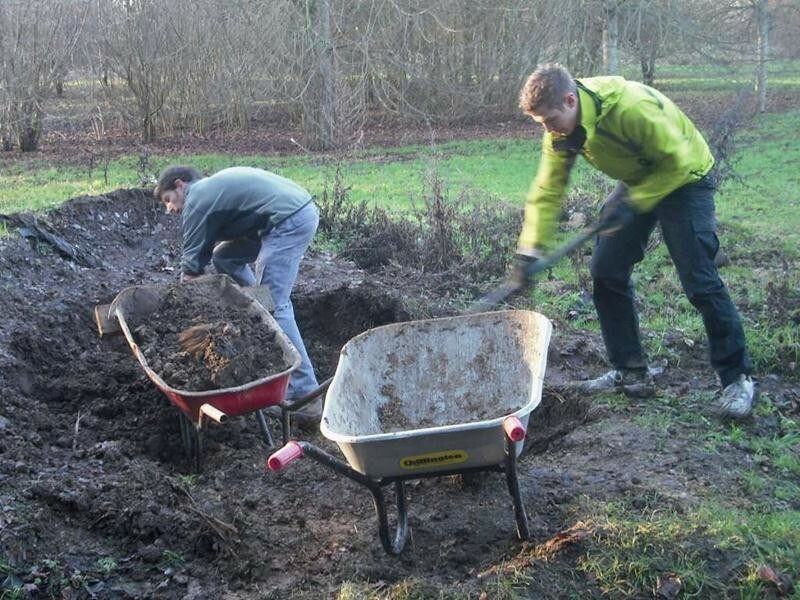 We do this job every autumn (see 2010 report). This was great team work. 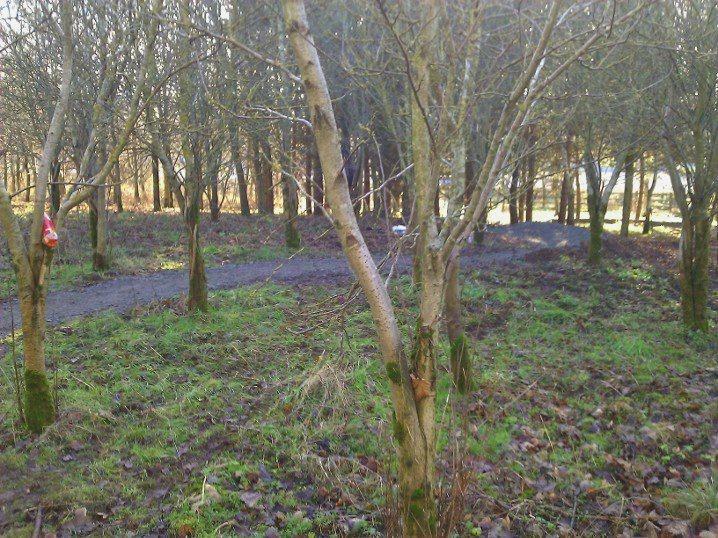 Some litter clearing was done from the trail next to the road – mainly rubbish that had blown in off the road. We installed three sign posts, plus cleared back some branches on the crossing just before Pete’s Impossibly Stupid Steps. By this time Mark and Mike Jeffries had joined us. In the afternoon we shifted about 7 tonnes of gravel from the latest 30 tonne pile in the triangle down to the furthest point. 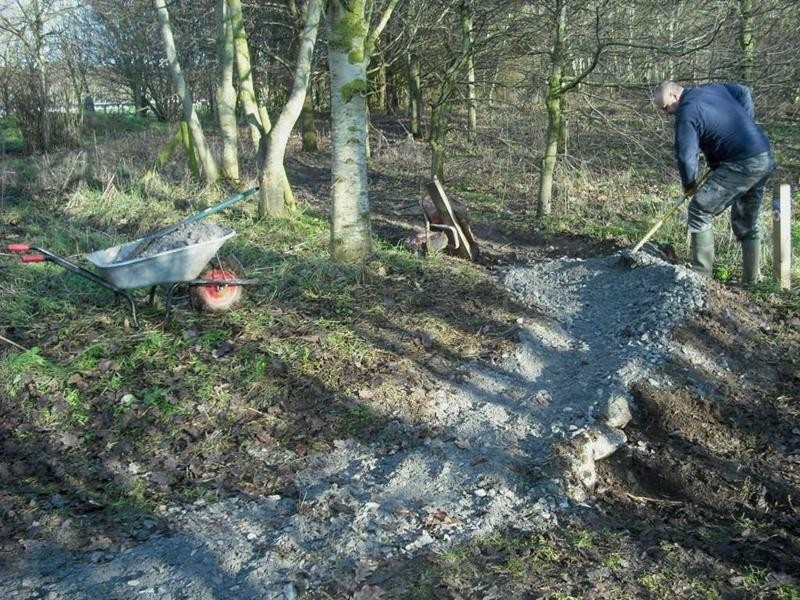 Thanks to everyone who turned up, it was great progress for a bonus trail build day. Our next trail build days are Saturday 26th November and Sunday 27th November. It would be great to see you there. Amazing! With a few more days like this we can deal with all the remaining boggy bits. A big thanks to everyone for making it happen. Out of berm and through trees. I had a good excuse though. I was, er, carrying out essential MBSwindon riding reconaissance in mid Wales. It wasn’t any fun, nor was the beer. 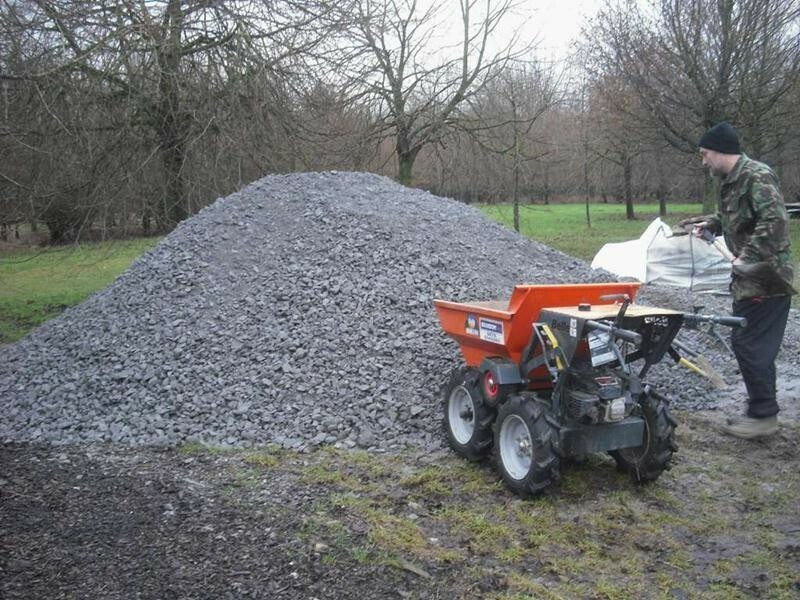 Phil reports that the power barrow had 100% utilisation along with Mr Anon’s van being filled with bags of gravel that were then tipped into wheel barrows near the drop zone. 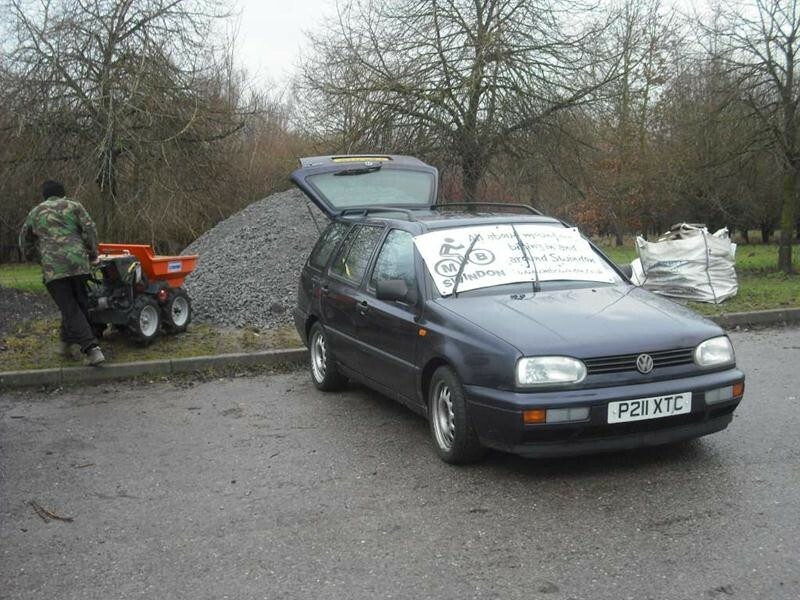 A team of four were working full time in the car park loading. 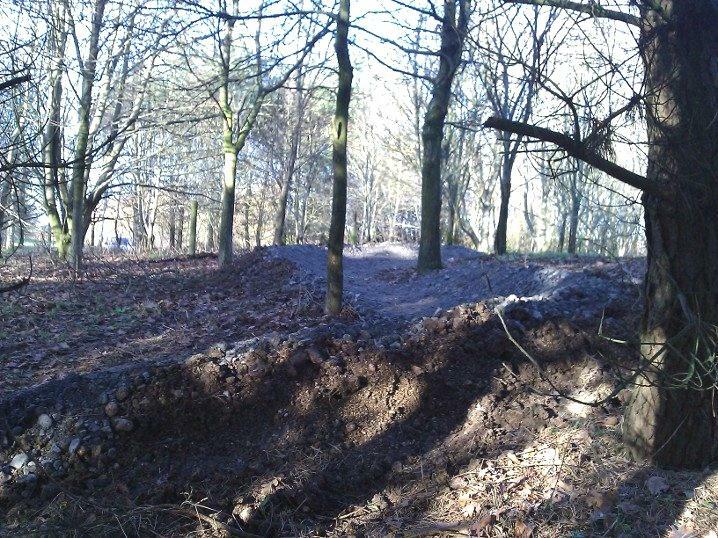 The result of this was that 200m of trail was surfaced in a day and the 20 tonne load was reduced to a sad little pile. 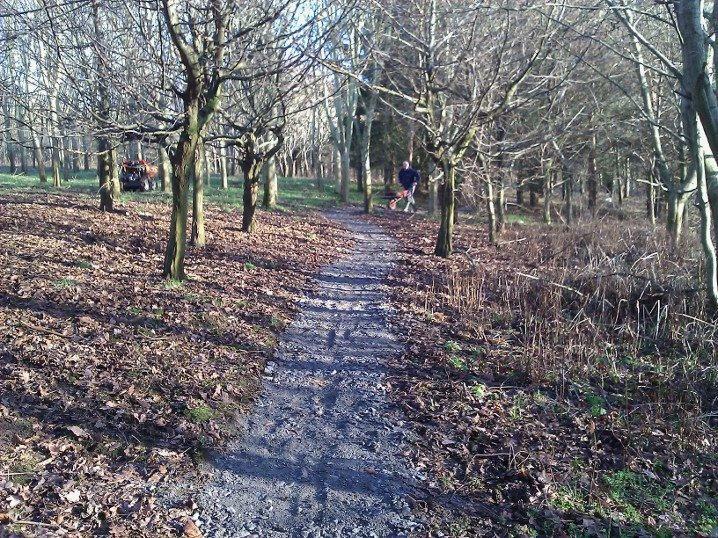 That’s another 200m of soggy trail dealt with. The berms that were built were originally tweeked back in January 2009. 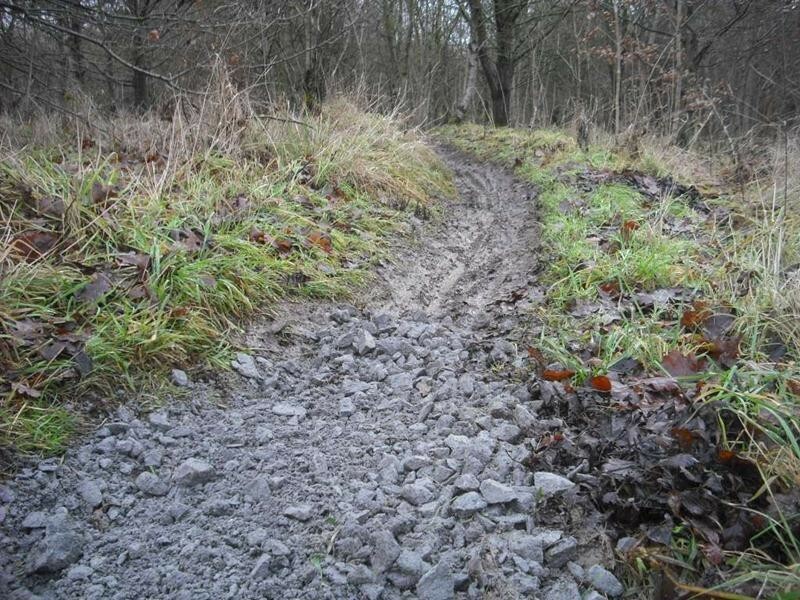 Our next big push is going to be sorting the muddy sections on the top of Piper’s hill. Build progress map 9th Jan 2011. 20 tonnes waiting to be used. This was our first build day of the year after a time when many people had been struck down with man flu and other build days had been hampered by snow and ice. 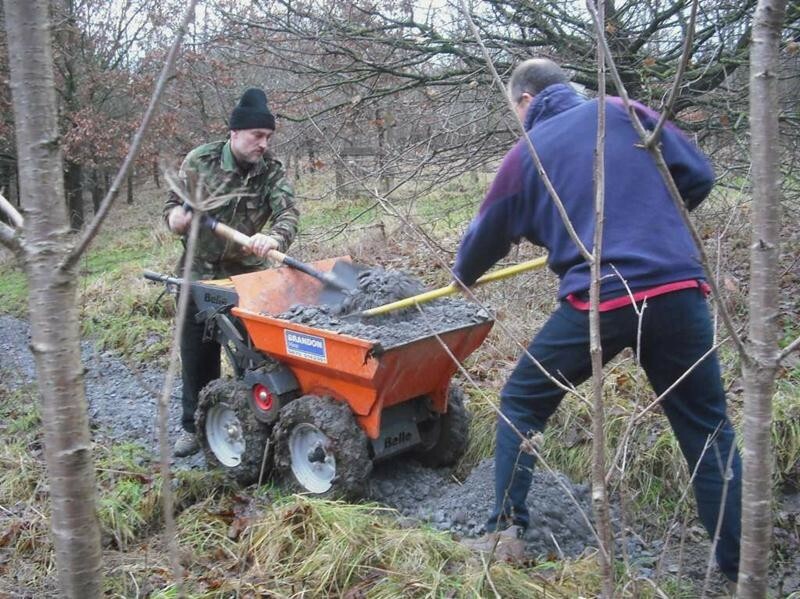 We were really keen to get on with our plans to surface the muddy sections of the trail. 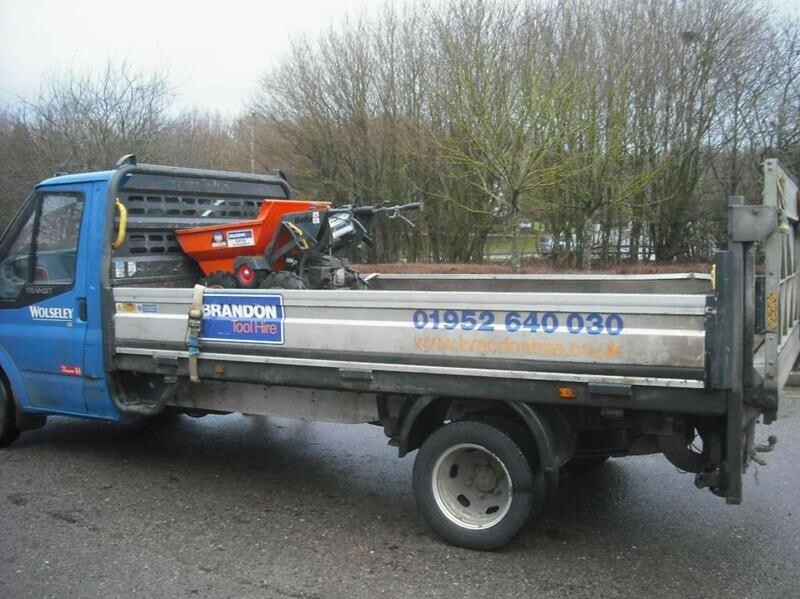 Brandon tool hire delivered the power barrow first thing in the morning. 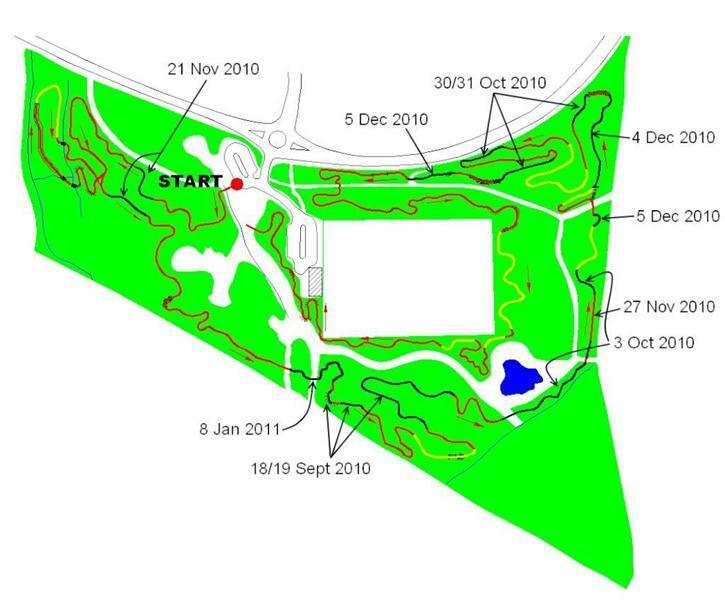 Tony had arrived early so the two of us started work on surfacing a short section of trail (see map below). We were soon joined by a new recruit who’s name eludes me (sorry). 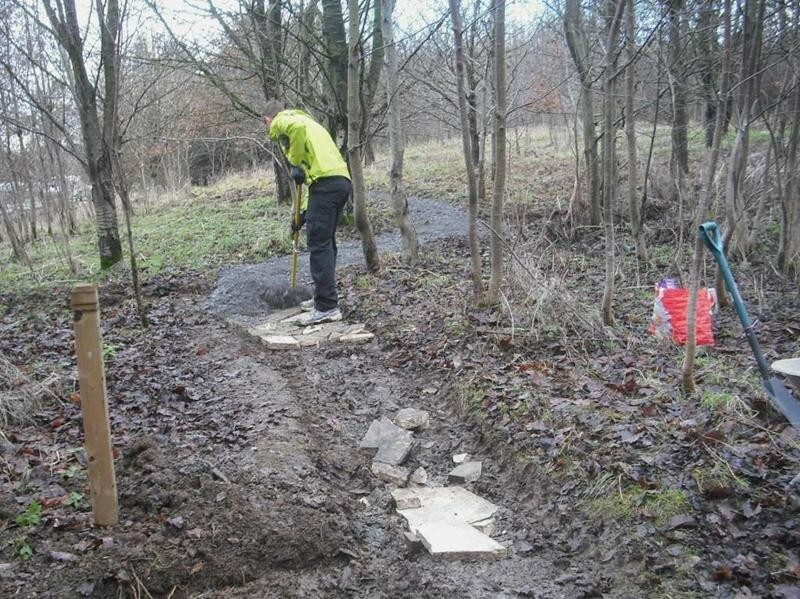 Due to the muddy nature of the section we dumped a load of slabs into the trail first. We had a change of personell at midday when Mr Anon arrived, along with Chris, then Ben and Lee. With the all women ride going on then Pete joined us too. 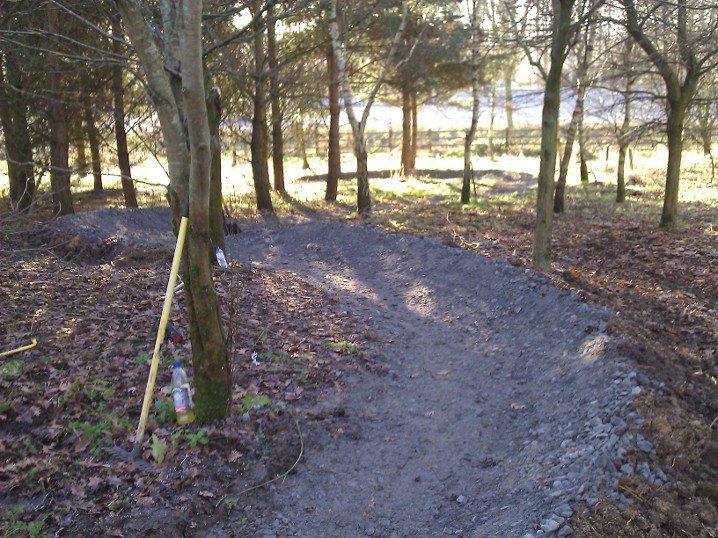 A new berm was added after the track crossing and we also shifted a lof of mud to double the size of two further berms. It was a really good start to our trail building year, with 100m of surfaced trail completed by the end of the day. Over 20 tonnes of Limestone chippings waiting to be used. The muddy stuff being covered over.